Through BrokerCommand’s centralized platform, brokers can quickly generate and issue proposals in minutes not hours, set up and manage client enrollments, process renewals, access and share valuable reports in seconds, and maintain important compliance documentation. “We feel there has been a dearth of smart tools that really work for the broker. 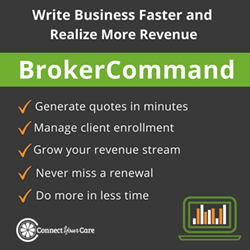 We are very excited that BrokerCommand actually serves both broker needs and the needs of their clients, enabling brokers to save time,” said Nicole Williams, Vice President of Sales at ConnectYourCare. As one of the largest and most responsive providers of health care savings accounts and award-winning solutions, our approach to consumer-directed health care is rooted in creating better, more efficient connections among the people who provide benefits, the people accessing services, and the people who deliver services. Blue chip organizations across the country turn to ConnectYourCare for our highly rated customer service and best-in-class member experience, advanced educational tools for better-informed choices, acceleration of savings with ROI efficiencies, and simplification of processes with brilliant customer-focused solutions. There is a unique solution for every company and employee, and we won’t stop working until we connect you with the perfect one. For more information, visit http://www.ConnectYourCare.com or follow us on Twitter @ConnectYourCare.